Jim Murphy - 5.81 @ 255! 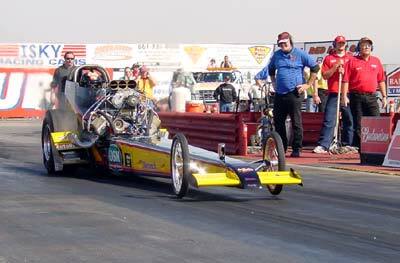 After a full year of frustration and bad luck, Jim Murphy and the WW2 Racing crew had it all come together at the 2002 March Meet. 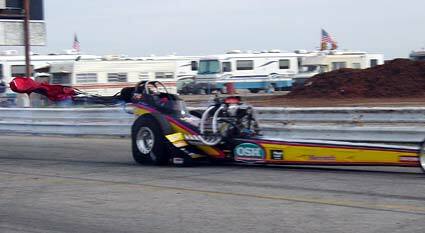 With new Crew Chief Tim Beebe on board, the Orchard Supply and Hardware sponsored fueler laid down a first round pass on Sunday that raised the bar in Nostalgia Top Fuel a bunch. A whole bunch! OSH-WW2 Racing wants that #1 back on their car and this definitely serves notice that they're serious about it. 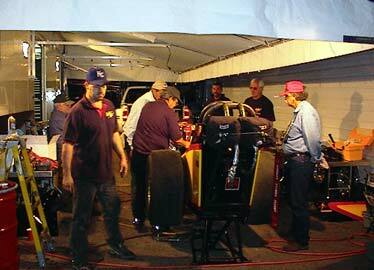 After qualifying #5 with a very respectable 6.03, Murphy and crew did a routine engine swap on Saturday night. 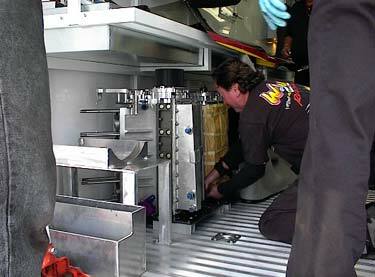 During which they found some metal shavings in the fuel system that were traced to a re-vamping of the fuel tank. 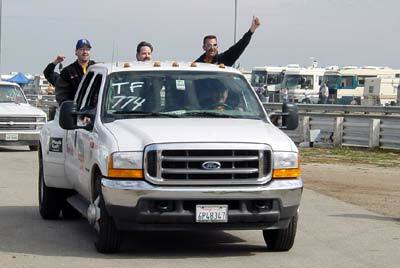 This gave the re-united duo of Beebe & Murphy the clue they needed to tune the car for Sunday. Tune it they did. 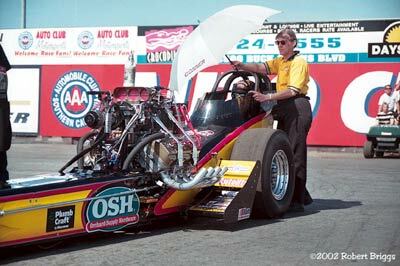 First Round of Eliminations: 10:05 AM Sunday morning, the OSH fueler made a run for the ages - picture perfect from start to finish - 5.81 seconds at an astonishing 255 miles per hour. No one on the property even questioned the times as everyone knew they'd just witnessed history. Mark Malde had the unenviable task of facing Jim Murphy in round one. Not that it mattered but Mark had all kinds of problems right off the line and ended up in Murphy's lane about 400' out. 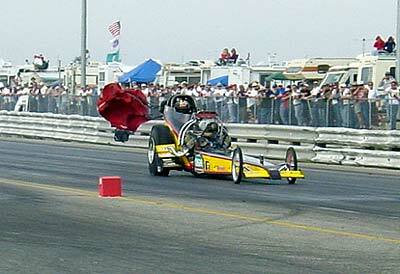 By then Jim was long gone on his incredible run and all Malde could do was look at his chutes on the horizon. Come to think of it, maybe Mark just wanted a better look at history? 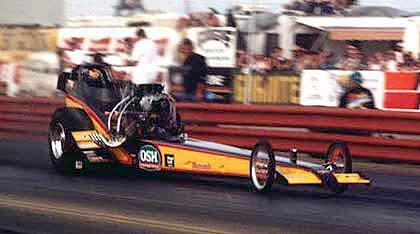 Even though the computer showed that Jim shut the car off 5.65 seconds into the run, it was marching so hard that the rear tires are still squared some 200 feet past the light. To say the least, the OSH-METRINCH-WW2 crew was ecstatic following their stunning run. Here they are on their way to pick up the car. 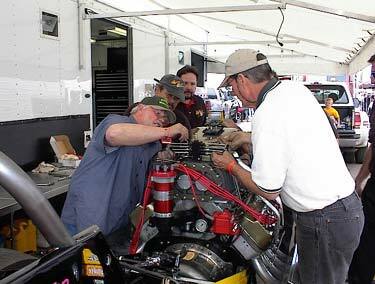 Crew Chief, Tim Beebe does what he does best - finesse the fuel system. Jim Murphy is more than elated to be reunited with his old partner as, "Tim coming on board has made my plate manageable". A new trailer (below) doesn't hurt either. 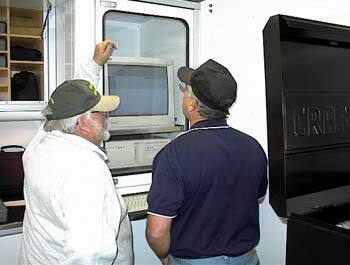 Starting with a shell, the WW2 crew outfitted this first class rig over the winter in their Santa Rosa shop. 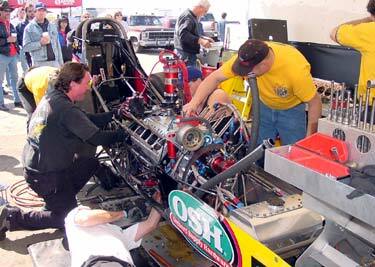 Following the blast heard around the world, Team OSH-METRINCH didn't have a lot of time to bask in the glory as they had to prepare the car for round two of racing. In the pits everyone has a job and they do it very well. 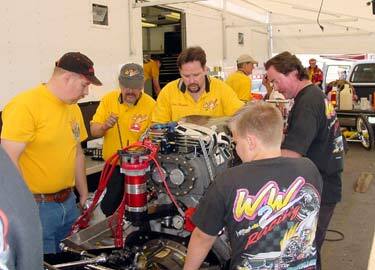 A Top Fuel crew must work as a well oiled team in order to maintain the constant integrate of the car and engine. Even a small mistake could be very costly. With everything back together the "fine points" are tended to. 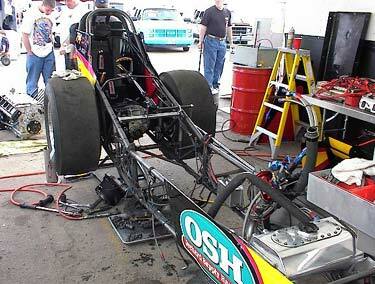 Jim Murphy's out of the box 6.03 at just 216 qualifying run on Friday just served notice of what Sunday would bring. Here's the chute coming out before the lights. 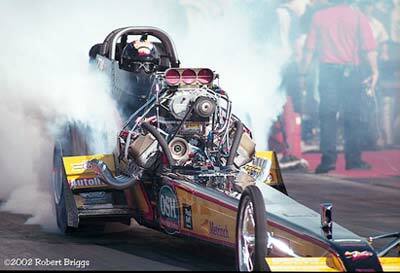 Up on the tires - not a whip of smoke from the headers. Hummmm? On Saturday the OSH team just "played". This shut-off 6.16 in the first of two sessions told them one thing, there was something wrong in the fuel system and it was not anything obvious. Their 6.25 in the second session confirmed it. This prompted the Saturday night thrash that revealed the aluminum shavings in the lines. That fixed the rest is history. 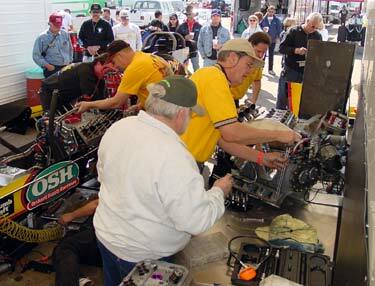 Following qualifying on Saturday it was decided to install a new engine for eliminations on Sunday. Although this is a beautiful car when its together, its not an attractive site during surgery. 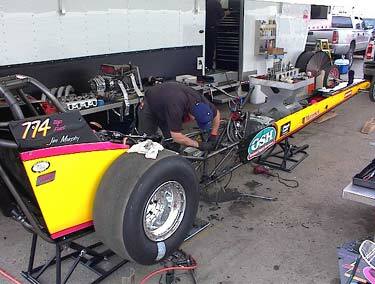 The spare short block is stored out of sight in the trailer until needed. Once the short block is out, all the components are bolted on. Team OSH works into the night to make sure everything is right for Sunday morning. The record run dictates they didn't miss a thing. The heart of the car is its computer. After every run Tim Beebe downloads the information and analyzes it so they'll know what changes to make for the next run. 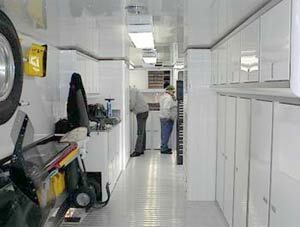 Without a doubt one of the cleanest and best laid out trailers in the pits. 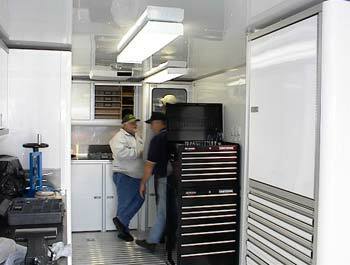 The new rig allows the team to perform their necessary tasks easier and faster. 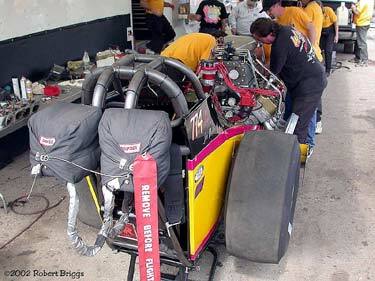 Prior to every run the car is warmed up in the pits. This not only puts heat in the engine but also tells the team that there are no leaks and that everything is functioning properly. 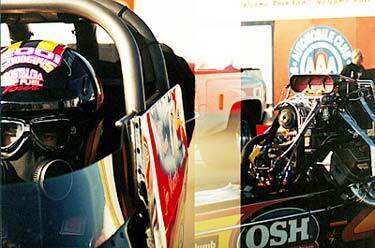 Wearing a seven layer firesuit, on warm days sitting in the cockpit of a dragster can be very uncomfortable. In such times Murphy has only the comfort of a good old fashioned umbrella to block the direct sun light. Here Jim waits for his second round match up with Gerry Steiner. Prior to every run, Murphy does a "burnout" (smoking the tires in water) which not only heats up the tires but the racing surface as well. 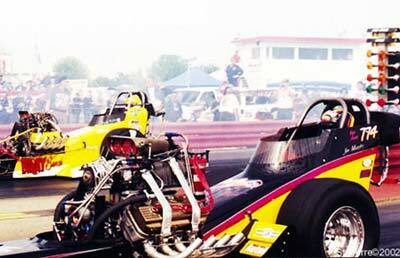 In the second round, Murphy's Donovan broke a rocker arm 2 seconds into the run, Gerry Steiner was able to catch and pass him for the win. 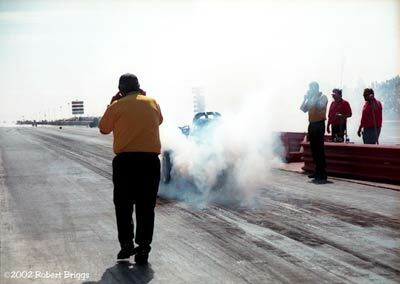 Jim banked a hundredth on the tree and was on his way to backing up the 5.81 pass when the rocker broke. 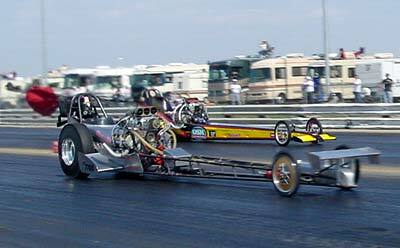 Jerry ripped off a stout 5.88 to Murphy's slowing 6.08. Look how close they are in the lights (below) - NOT your basic 2+ tenths spread.